Acme PS-316ESR Xeon Scalable 3U UP server Socket P (LGA 3647) DDR4 SAS3 16 hot-swap 2 10GbE Black Color. Supports up to 1TB of Registered DDR4 2400/2666MHz memory. Integrated IPMI 2.0 with Dedicated LAN RJ45 remote management, KVM-over-LAN support. 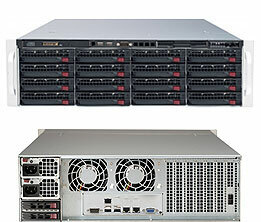 12 of 3.5" HDD hot-swap bays ( w/ SAS3 expander backplane), connected to hardware RAID controller supports enterprise level SAS/SATA drives or SSDs. Option to add 2 x 2.5" hot-swap drive bays (rear side). Width: 17.2 in. Height: 5.2 in. Depth: 25.5 in. * Processor, Memory and hard disk drive are not included. ** add heatsink per each CPU.